Arizona Pottery sells one of the largest collection of talavera pottery, garden animals, luminarias, spheres and so much more. We imported directly from the factory to our Tucson warehouse where we ship it across the US to you our beloved customers. So, you see it and you love it but let's talk a bit about what it is and where it comes from. Talavera is one of the finest ceramics of Mexico and from the Spanish colonial period of rich old world design and colorful heritage. 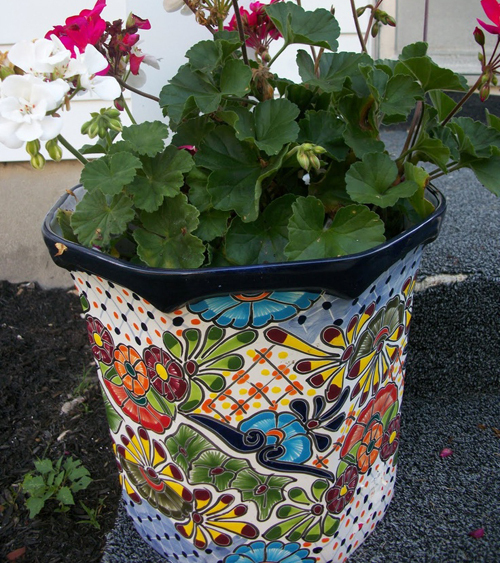 Talavera pottery was first introduced to Mexico by Spanish guild artisans of the colonial perios. Commonly called "majolica" in Spain, Mexican Talavera draws its name from the 16th century Spanish pottery center, Talavera de la Reina. The process to create Talavera pottery is elaborate and it has basically not changed since the early colonial period when it was first introduced. The first step is to mix black sand and white sand. 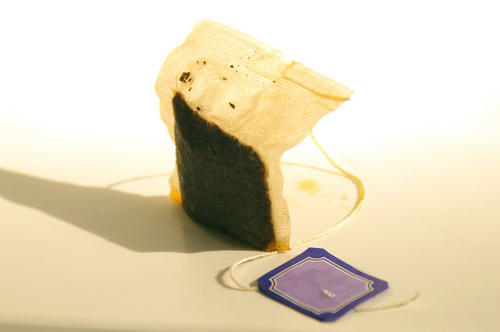 It is then washed and filtered to keep only the finest particles. Next it is shaped by hand on a potters wheel, then left to dry for a number of days. Then comes the first firing . The piece is tested to see if any cracks occur. The initial glazing, which creates a milky white background is applied. After this, the design is hand painted. Finally, a second firing to harden the glaze. 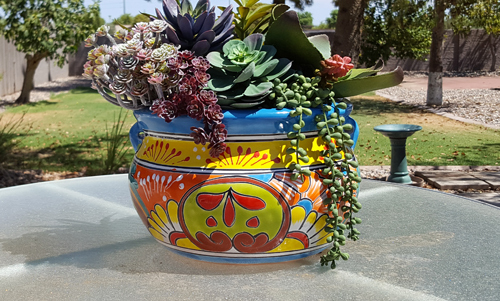 One of the most desired things about talavera pottery is the bold bright colors and unique patterns. Since each piece is hand painted they are one of a kind. 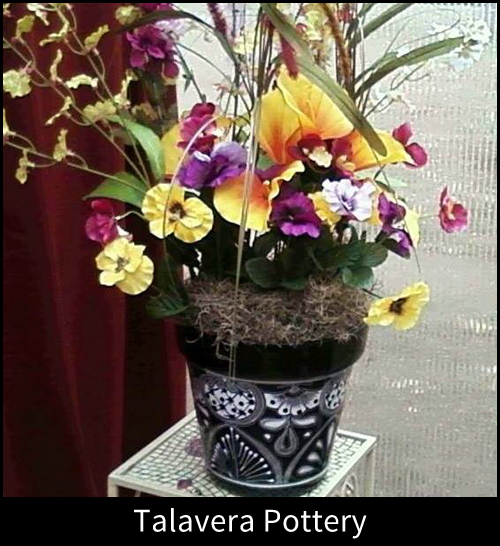 Everyone knows the look of talavera and it is well loved through out the world. At Arizona Pottery we try to carry the largest and most unique patterns and designs. If you have little furry cats around you house, then this post if for you. In Arizona it is dangerous to let you cats outside, so our cats are considered indoor animals. 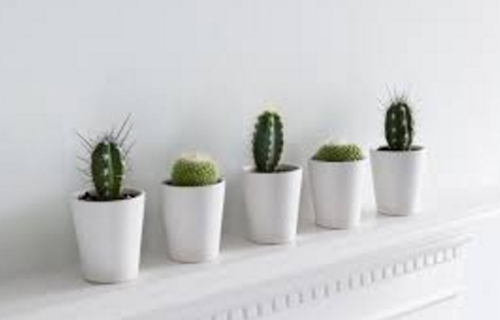 That means you have to be aware of any potted flowers or plants that you bring into the home. 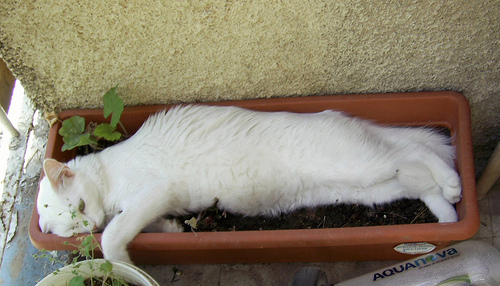 If you want to pot up some plants it is best to google it to see if they are toxic to cats or not. When it comes to cats wanting to use your potted plants as a litter box we suggest you cover the top soil with pot shards, colored rocks or toothpicks. Anything works that the cats don't want to touch their feet and makes them uncomfortable. 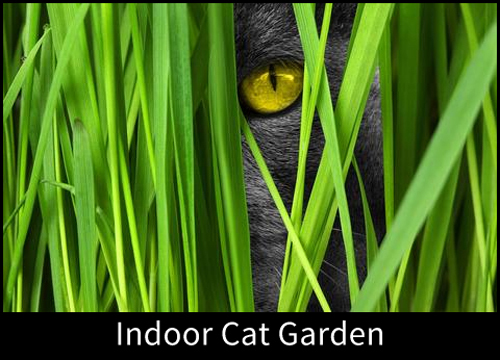 Now we want to talk about the substance of this post and that is to create a indoor cat garden just for your little furry indoor friends. 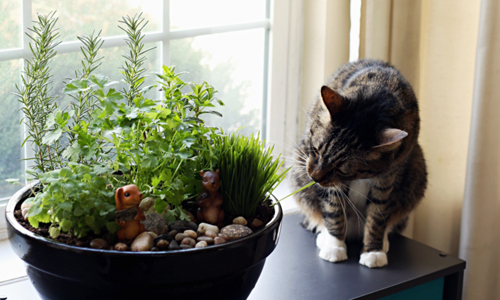 By planting things like cat grass you can cure their craving for greens. This gives them a chance to eat the leaves that are both healthy and tasty to them without any issues. But don't just pot up food, make it decorative and fun so that everyone not only the cats get to enjoy looking at it. 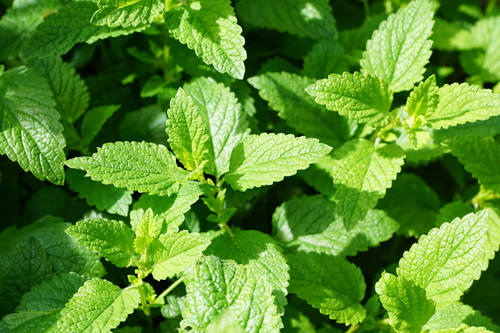 Here are some plants that we recommend. 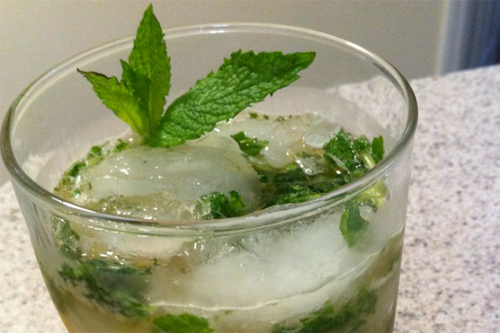 Cat grass, Catnip, Parsley, Mint & Rosemary all work great. Select a low bowl garden container so that the cats can reach the plants without having to climb or jump. Make sure the flowerpot is wide and low so that it can't be knocked over. 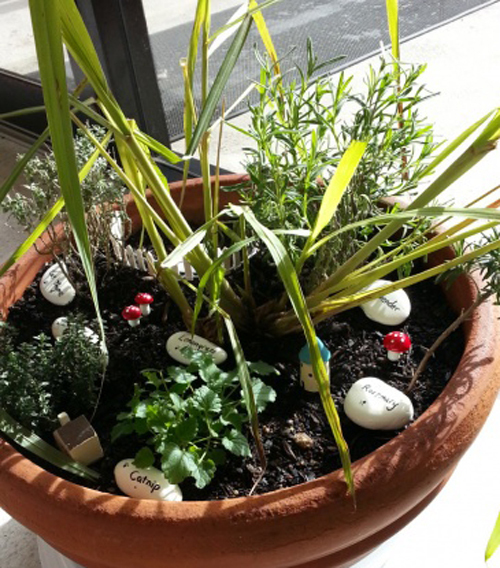 Top the soil with decorative rocks and little figurines to create a cute look that is both playful and functional. The rocks will keep the cats from using it as a litter box. 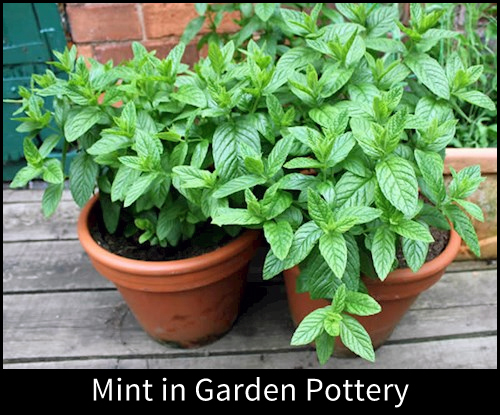 Place the pot in a sunny window and keep the soil moist so that the herbs will grow and not dry out. Then stand back and watch your little ones gather and enjoy! 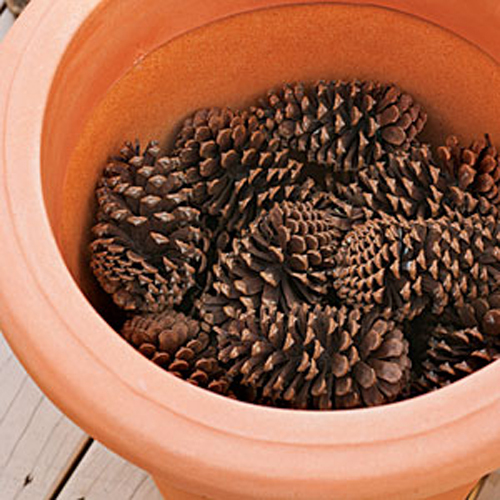 Can you really ever have enough gardening tips and garden pottery tips. We don't think so. We would like to share a few random ones that are our favs. Hope you can find something useful. 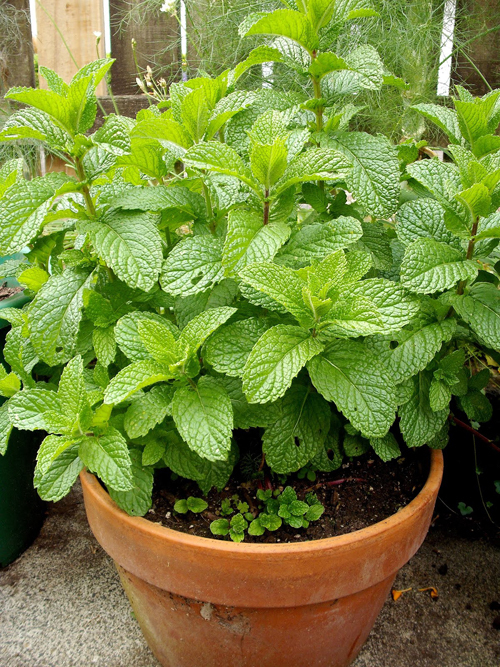 To discourage pests from preying on potted houseplants, steep 2 TBS lemon peel in 4 cups of water. Strain the mix. 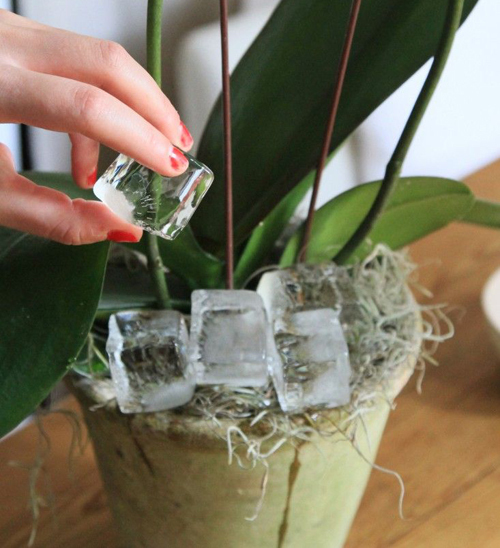 let it cool and spray on the potted plants leaves. The citrus oil from the lemons repels insects without doing any harm to the potted plant. 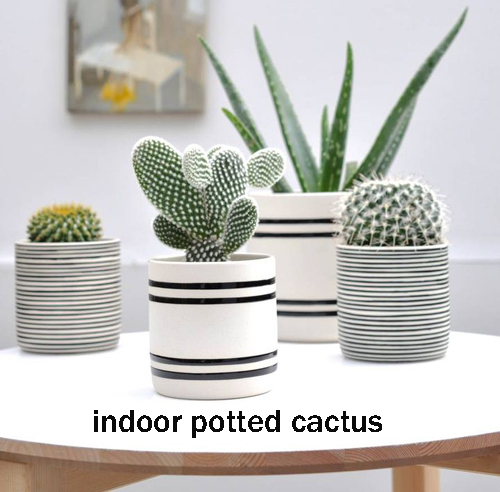 Water Houseplants in Pottery half as much! You love how leafy green plants brighten up the house, but thanks to dry indoor heat, you have had to water them nearly every day. That's because much of the water evaporates before the potted plant can absorb it. Corks to the rescue! Use a food processor to grind up 8 to 12 corks, then mix them into your potting soil. 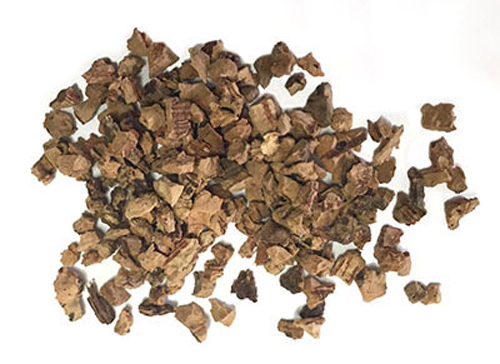 The air filled cork cells with absorb excess water and slowly release it as the soil dries out, cutting your watering duties in half. Indoor pollution levels can be more than 100 times higher than outdoors, particularly when the windows are closed. 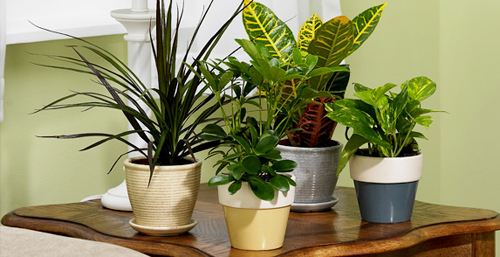 Your typical potted houseplant can remove up to 87% of indoor air toxins within 24 hours. The most effective are spider plants & potted mums. 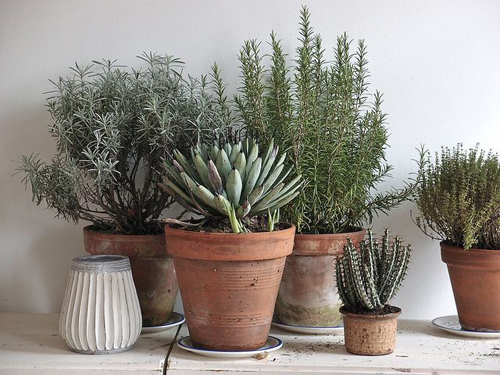 Perk Up Dull, Dreary, Potted Houseplants! 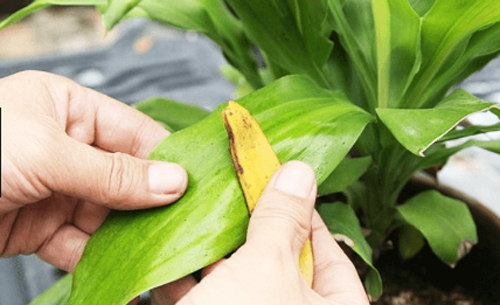 If your potted houseplants look like they need a pick me up, give them a quick rubdown with the white side of a banana peel. The skins rough texture will gently buff away dust, white it's natural oils moisturize. 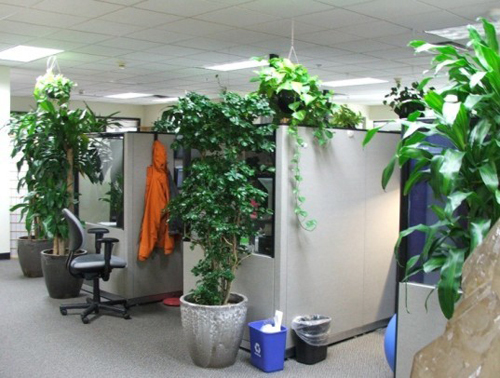 Put A Potted Plant On Your Desk At Work! Low indoor humidity, a hallmark of colder months, can speed the evaporation of tears by up to 99%. This leaves the eyes surface vulnerable to airborne irritants such as ozone and formaldehyde, which are readily produced by laser printers and other office equipment. Luckily, leafy potted houseplants can reduce a rooms pollution level by 97% within 50 mins. Potted Plants literally neutralize airborne toxins and they hydrate the air as they breathe, reducing the odds of dry eye recurrence. 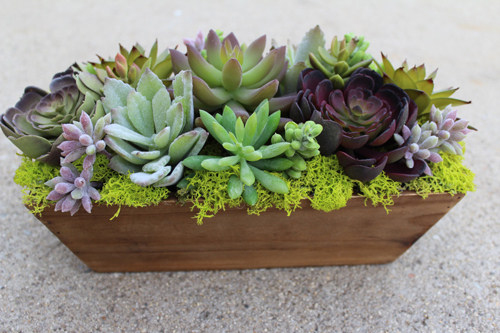 Using fake succulents to make a garden container is not only smart but economical. 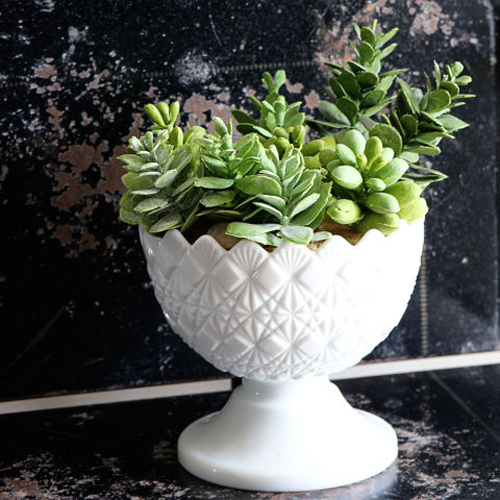 Not only do the new faux succulents you can get at craft stores look real but they come in a huge variety. Not all garden centers carry the vast variety that you can find in faux. And yes, they really do look real. First select a garden container. We like a large garden bowl or bulb pan. The width allows for a larger variety of plants spread out instead of them all piled up on each other. Once you decide on the planter, cut a piece of styro foam to fit inside and approx half way up the planter. 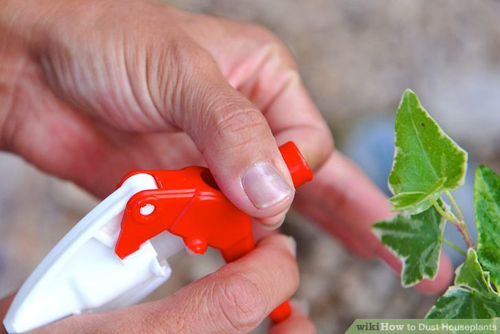 Use glue to attached it to the bottom of the planter. 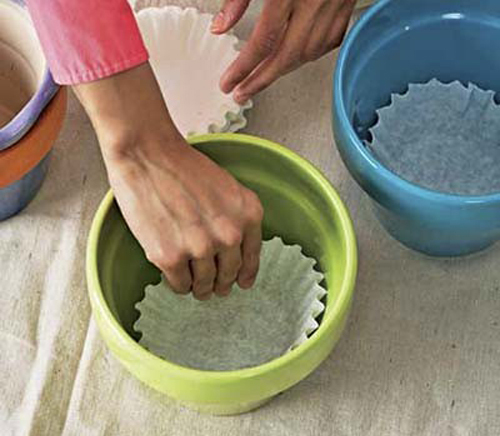 You may need to criss cross the top of the foam with clean tape attaching the tape to the sides of the planters. No body will see these when you are done. Next cover the foam and tape with moss. Bags of dried moss are available at all craft shots. Just tuck it around the foam and fill in the gaps with it making sure that no foam is showing. 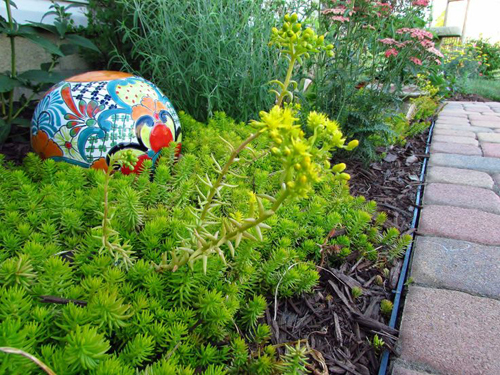 If the planter is going to sit on a patio table or coffee table we recommend placing the succulents first in the foam then covering the foam with small decorative rocks. This will allow for rain run off to drain properly. 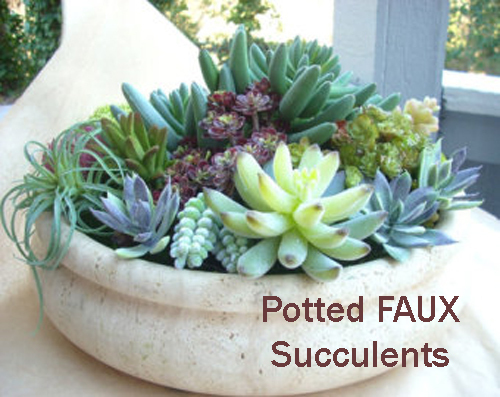 Start with the large faux succulents and place them in the middle and one one each side. Press them into the foam once, do not keep making the holes bigger, just one good punch thru and it should be the height you desire. 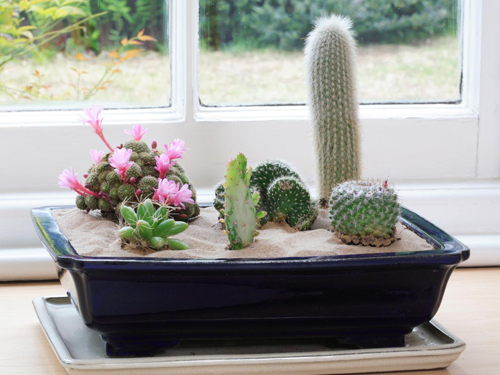 Now place med fake succulents ending up with the smallest size. Use these to fill in around the sides of the garden planter. Add a string of pearls to drape over the side. Make sure to work on all sides and you fill in. 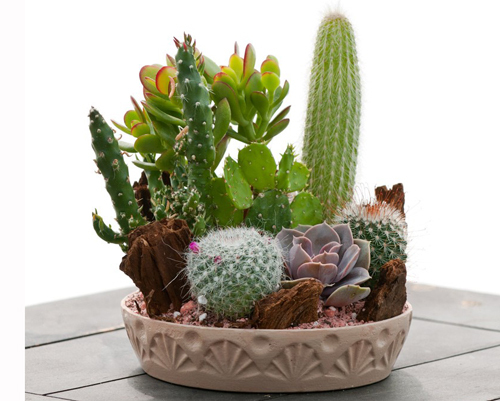 If the potted container will be where wind can get to it we recommend you use a craft glue to glue the stems of the faux succulents once punched thru. 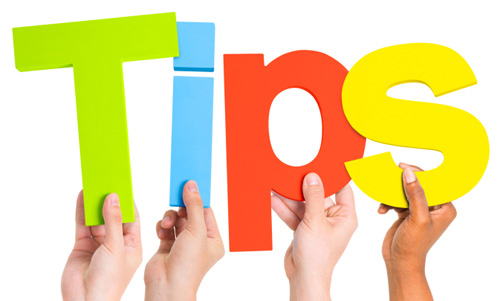 If you are using moss then lay down a bead of glue first and press the moss down firmly on top of it. End with any decorative touches. A raffia bow, garden rocks, flower picks. When you vacation do you go to the tropics? 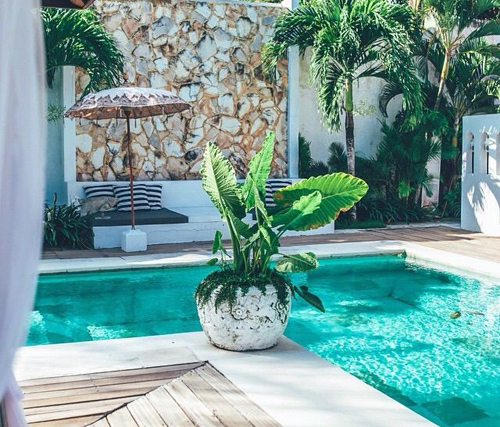 Do you love the look and feel of a tropical location? Well how about potting up some palms to use indoors or outdoors at your own home! We know it sounds like it would be difficult especially if you live in a location that is not known for having a sunny location, but trust us if you follow a few simple steps even you can duplicate that tropical feel at home. There are a lot of varieties of palms that are sold as houseplants in most home and garden center. You should be able to find what you are looking for. Basically they make great houseplants and can stand a bit of neglect but of course will grow their best if treated properly. 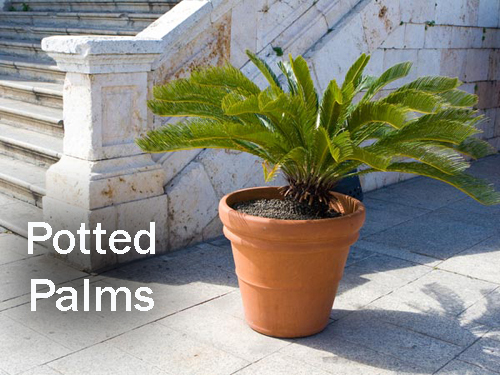 Potted palms can last many years so make sure you get the style you desire to get the affect you require. 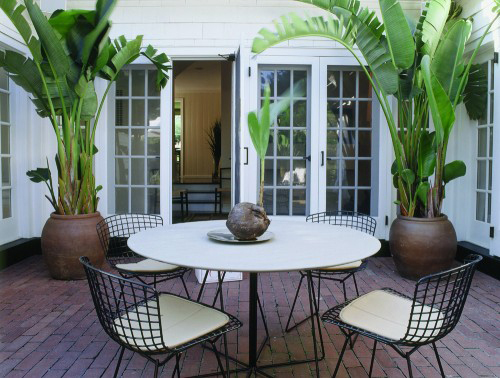 And, remember that potted palms get large so plan on moving it outside during the summer months to enjoy on your patio. All palms basically require the same things. Water, sun, fertilizer. 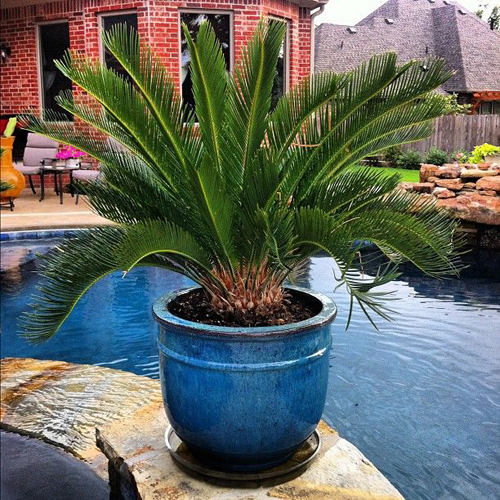 Potted palms can tolerate being under watered but do best in a moist soil, especially during the summer months. Allow the soil to dry out slightly between watering and dry out a bit more in the winter. Be careful not to over water. That is the number one killer. When it comes to sunlight palms can handle low light but prefer indirect light or some shade. If you put them out during the summer make sure to keep the potted palms in the shade. Soil should be made for potted palms not garden soil. It needs to include moss or vermiculite to keep it loose and porous. 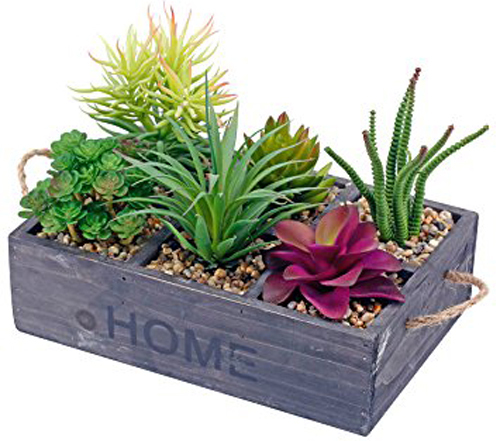 We suggest purchasing the soil from a garden center that is meant for a palm. 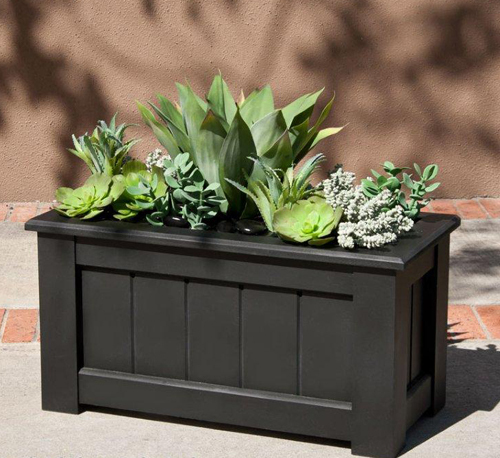 A garden planter should be large enough to hold the palm but since they don't like to be re-potted we recommend you get one a bit over sized. Remember that if they become root bound it is not a bad thing for a potted palm. Use fertilizer for potted palms and watch out for spider mites on the potted palm is indoors. Any brown spots you can trim off but this is not harmful to the plant it just looks unsightly. 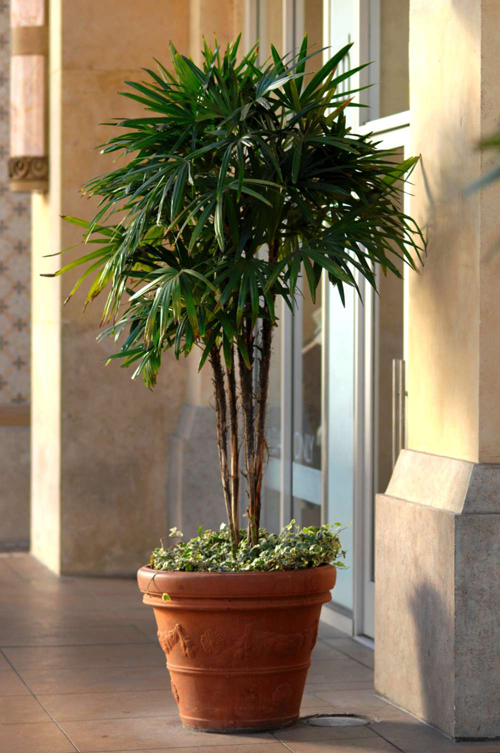 A potted palm whether indoors our outdoors requires low maintenance and will last for many years. 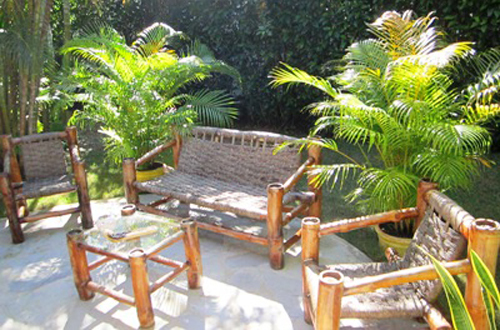 Now is the time to create that tropical look and feel that you yearn for and a potted palm is the easiest way to do so. [Read More] Soil For Planters. [Read More] Blueberries in Garden Containers.